Teeth Whitening is one of the most economical ways to brighten teeth and enhance your smile. Your smile creates an immediate, visual impact on people you meet. As per research by the American Academy of Cosmetic Dentistry, 74% of adults feel an unattractive smile can limit a person’s career success and when the respondents were asked how they can improve their smile; the most common response was via whiter & brighter teeth. For people looking for teeth whitening New Hyde Park, Long Island NY cosmetic dental experts at NIDA can provide the absolute best treatments. A bright smile gives the impression of healthy teeth, youth and happiness. Eating or drinking stain causing food items such as coffee, wine, berries, sauces, etc. Being exposed to high levels of fluoride while teeth are developing . As there are different reasons for tooth discoloration, there are many procedures that can brighten and whiten your teeth. The two most common ways are in-office treatment and a do-it-yourself approach. If you or someone you know is in need of teeth whitening New Hyde Park, Long Island NY dentists at North Island Dental Arts will work with you to build a cosmetic treatment plan that will address your dental concerns and meet your cosmetic goals. In-office Teeth Whitening – Teeth whitening in a dental office is the most preferred teeth whitening method. Stronger agents are applied but you can be assured that the rest of the mouth including gums is protected from these materials. Your teeth can brighten up to 10 shades in a single visit only. Tooth whitening can last up to one or more years, depending on how well you take care of your teeth. To find out if you are a good candidate for teeth whitening, call us at 516-616-4800. Over the counter products - Home tooth whitening systems have become quite popular because they are inexpensive and easy to use. Some of the over the counter products include whitening toothpaste, whitening strips, tooth gel and more. While these products may be easy to use, if you have oral concerns, you should consult your dental expert to ask whether these products are safe to use. These products might provide you temporary results but the dentist supervised whitening treatments are the safest and the most effective method for brightening your smile. Q: What options do I have if I am looking for teeth whitening near me in New Hyde Park, Long Island NY? A: North Island Dental has an office conveniently located in New Hyde Park on Long Island, and we are available to provide in-office teeth whitening for our patients, as well as recommend the best methods for keeping your smile bright after your whitening. Many different substances can stain your teeth, and the best way to help your smile is to come to our office and find out more about our teeth whitening procedures. Q: Am I a candidate for teeth whitening? A: The ideal candidate for a teeth whitening procedure is someone who has healthy gums but has an issue with stains or discoloration of their teeth. Teeth whitening is a very safe procedure, but if you have any questions or concerns regarding teeth whitening, it is important to ask the dentist during your consultation. We are happy to answer all of your questions about having your teeth whitened. Q: How many times do I need to get my teeth whitened? 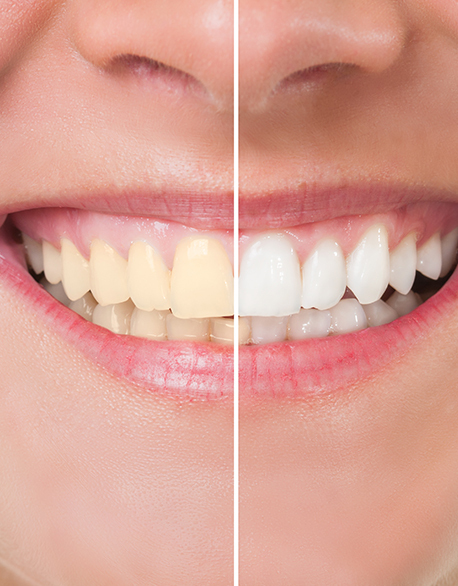 A: Our in-office teeth whitening treatments offer truly incredible, long-lasting results. However, there are a large number of substances that can cause your teeth to be discolored. Eating and drinking will continue to discolor your teeth as time passes, so many of our patients will opt for treatment again after a given amount of time that differs from person to person. Q: I’ve been trying to find products for teeth whitening New Hyde Park on Long Island NY has lots of stores with over the counter whiteners, how are these different than in-office whitening? A: Some over the counter products can give you decent results, but nothing beats an in-office whitening procedure from our highly trained dental experts. At North Island Dental Arts our team can give you the bright smile of your dreams. Teeth Whitening New Hyde Park dental experts at NIDA will also consult with you and teach you the most effective techniques for taking care of your pearly whites. Our patients trust us to give them the smile they are looking for, call our New Hyde Park office on Long Island for your appointment today! Q: What can I do to maintain the results of my teeth whitening? A: The best way to maintain a healthy smile is with correct oral hygiene and avoiding substances that cause discoloration of the teeth as much as possible. These substances include coffee, tobacco, wine, etc. When you come to our office for your procedure, our hygienists and dentists will instruct you with proper dental hygiene techniques and recommend the best regimen for keeping your teeth bright and beautiful. If you want to learn more about Teeth Whitening Long Island dental experts at NIDA can explain all of your best options to you. Our New Hyde Park office is easy to get to from all of the surrounding towns in Long Island, and we are one of the leading providers of teeth whitening on Long Island. If you want to learn more about Teeth Whitening Long Island dental experts at North Island Dental Arts will assess your smile with you, and explain all of your options for getting the bright smile you are looking for. Teeth whitening is one of the most common cosmetic treatment options taken by patients. The dental experts at North Dental Island Arts can help patients achieve a white and bright smile that looks natural. People with whiter and brighter smile are more confident about their overall appearance. To learn more about teeth whitening treatments, call us at: 516-616-4800.